As puppies grow, they progress through multiple different stages of development. Each of these stages is important for a different reason. 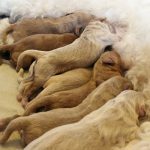 As breeders, it is imperative that we have a strong understanding of these seven stages so that we can effectively support and stimulate our puppies as they develop and prepare for their big adventure in the big wide world! 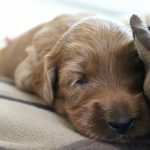 It is also important that as a puppy owner, you understand the developmental phases your puppy goes through on the path to adulthood. 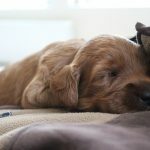 If you take an interest and dedicate some time to understanding the world from your puppy’s perspective, not only will it help immensely with training, but the bond that you have with your puppy will be even stronger. The nervous system develops significantly during late pregnancy through to five weeks old. The size and complexity of the nervous system starts to be shaped in the final stages of pregnancy. Synaptic creation and pruning begins shortly after birth. Nerve cells connect through synapses and these synapses cause cognition. In other words, these synapses enable puppies to learn, remember, plan, reason and problem solve! 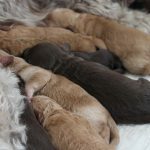 The puppies are limited in their abilities and rely very heavily on their mum, who provides almost everything they need. They cannot regulate their own body temperature because they cannot pant or shiver, so one of our most important jobs is getting the environmental temperature just right. It is also very important that the puppies mother has an environment in which she feels safe to nurse her puppies. Elevated maternal stress has a lasting effect on puppies, so we are particularly protective of mum during this stage. No strangers are allowed into the room, we block out strange sounds by playing gentle music, we focus on keeping mum stress-free so that she can do a great job with her litter. Our other important job is keeping everything clean. Puppies are born with no immunity, so cleanliness is key during this stage. 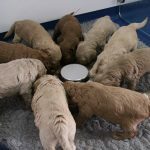 We must clean and disinfect every day whilst the puppies are gaining immunity through their mother’s colostrum and milk. Last but most certainly not least, we gently stimulate neonatal puppies’ senses. This has a positive impact on the creation and pruning of synapses, which has a positive lasting effect on the puppies’ nervous systems. This benefits their adult senses and improves their adult temperament too. 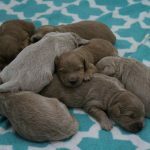 Between two and three weeks of age, neonates rapidly transition into puppies! At the start of this phase their ears remain sealed, but by the end of it, they are able to hear. They also become more vocal, their eyes open and they have some limited vision. Puppies start to move around a lot more at this stage, they begin to engage with each other and wag their tails. They can pee and poop all by themselves now without any help or stimulation from mum and you probably know what this means, more cleaning up for us! 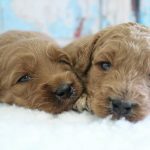 You have probably heard the turn of phrase, use it or lose it– this is particularly applicable to puppies’ mental development. Our job at this stage is to begin exposing the puppies to limited stresses which enables them to maximise their brain development. We introduce the puppies to toys and small obstacles which provide the perfect level of stress to develop them without distressing them, and we handle and engage with the puppies more and more. 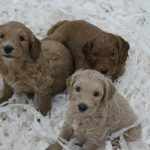 The sensitive period is the more important developmental time in a puppy’s life. 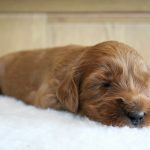 The experiences a puppy has in this period, positive and negative, imprint on the brain and have a long-term effect, even if the experience is infrequent or doesn’t last a long time. Puppies learn best what they learn first, so we do our very best to set them up for success. 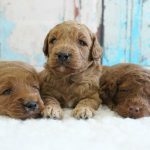 Puppies are very sensitive to the external environment during this phase, much more so than the preceding transition period, or the juvenile stage that follows. 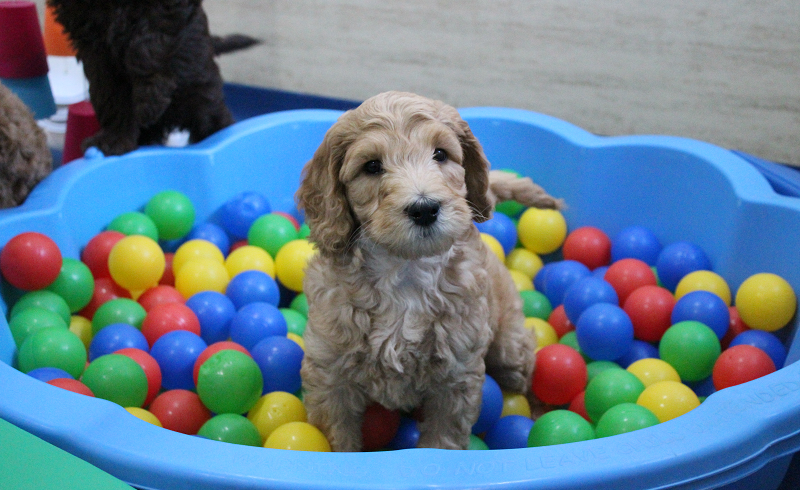 Our clients often ask us about puppy socialisation – this is the key time where socialisation has the most impact. 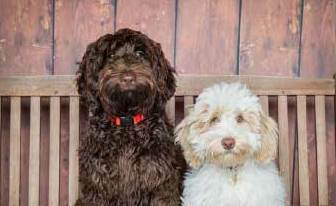 Socialisation does not just mean meeting lots of people or other dogs, it means learning how to behave appropriately when doing so, learning how to play – on their own, and with people and other dogs. The puppies are here with us, growing up, for the first 5-6 weeks of the sensitive period. During that time, we expose them to many different sights, sounds and experiences, and we use their natural instincts to teach them desirable behaviour. 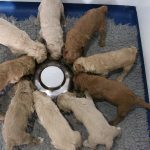 Our puppies go to their new homes when they are 8-9 weeks old which means they spend the next 7-8 weeks of the sensitive period with their forever families. During this time, there is a lot that you will want to achieve with your puppy, and the clock is ticking, so on your marks, get set, go! Have a positive experience with the vet - use treats! This section has only covered development and socialisation. You want to be training your puppy during these weeks too, so you had better clear your diary. 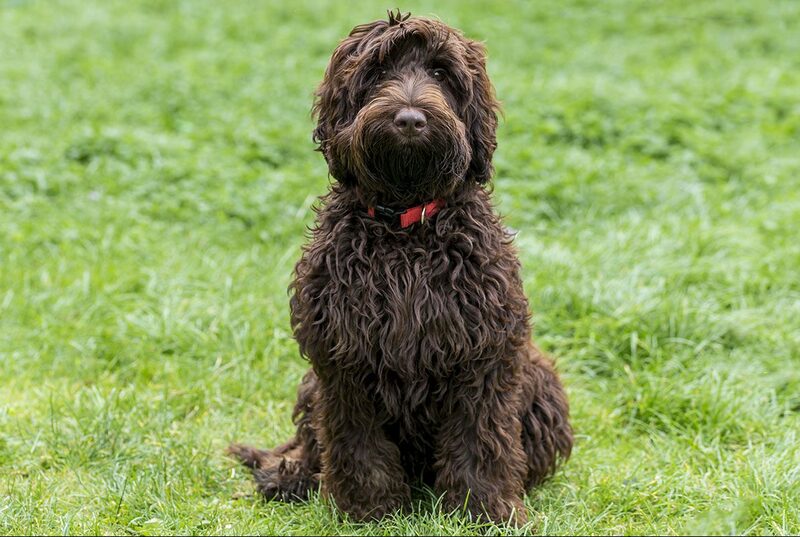 Every family and puppy is different, so we work to match our customers with a puppy that is a perfect fit. 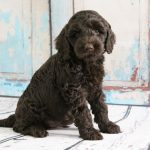 Would you like to have a Labradoodle and pay only 25% of the full price for a puppy?